As the humanitarian crisis in Calais grows, the media is increasingly dominated with tales of savagery and menace in the refugee camps. But the reality couldn’t be further from the truth. 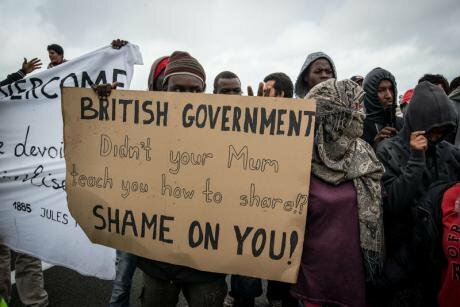 Refugees in Calais holding signs that are critical of the British government. Credit: Demotix/Guillaume Pinon. The refugee crisis in Calais is escalating rapidly. Around 5,000 refugees are camped out in the northern port town in France, with as many as 150 arriving every day. Nicknamed the ‘Jungle’, conditions at the camp are poor, and authorities are faced with the dilemma of addressing a growing humanitarian crisis without making conditions attractive enough to encourage newcomers. Pay attention to the mainstream press and you’d be forgiven for thinking the Jungle is awash with violence and thievery, perpetuated by those looking to take advantage of Britain’s generous welfare system. Indeed, according to a YouGov poll, 64% of Londoners think easily-obtainable benefits are the main reason for this exodus to England. But far from being driven by economic migrants, this crisis is largely about refugees fleeing dictatorial oppression, war and religious extremism – by the end of July this year 62% of those who had reached Europe by boat were from Syria, Eritrea and Afghanistan. Speak to the individuals at Calais themselves, and most will say they want a job, not handouts. Furthermore, speak to those that have visited the camp and they’ll tell you that the so-called ‘Jungle’ is not a place of crime and danger, but a peaceful place of tolerance, solidarity and sharing. This is a sentiment echoed by many charity organisations that have stepped in to help those at the very heart of the crisis – the refugees themselves. But it’s not just charities and official organisations that are taking action; ordinary people from around the UK – tired of waiting for a political solution to this state of emergency – are getting involved to help those that are in need. People to People Solidarity is a Facebook-centric group that acts as a central hub for those wanting to take practical action in Calais. Here, UK Facebook users can share information and organise trip logistics, with an events stream dedicated to upcoming humanitarian journeys to the Jungle from all corners of the country. Personal, political and religious discussion is discouraged to make space for constructive information sharing, such as the most needed supplies on the ground and the locations of particularly vulnerable refugees who need the most urgent assistance. Cycling offers a sense of freedom, mobility and self-sustainability, and for many people living in the camp a bicycle is an invaluable asset, improving access to basic facilities, many of which are over an hour’s walk away. Bikes Beyond Borders was started by a group of cycle-loving friends who want to help the humanitarian situation by donating bikes and other provisions to the Jungle’s refugees. The group has organised a number of rides from London to Calais across the August bank holiday weekend to get bikes to the camp, but is also looking for support vehicles, general donations and words of encouragement to help along the way. Increasingly horrified at the “diabolical conditions” forced upon migrants and refugees – many of which are orphaned children and pregnant women – Diane Fotheringham packed a van full of clothes, food, sleeping bags, toiletries and other goods, and drove 500 miles from her Glasgow home to distribute provisions at the camp. Speaking to The Huffington Post, Fotheringham said: “We wanted to show the people living in the Calais camps that people in Britain do care.” Indeed, her crowdfunding page was set up with a goal of £500 – at the time of writing the amount raised stands at £4,500. What started as a documentary-filmmaking mission by travel blogger Jaz O’Hara has swiftly turned into one of the biggest awareness-raising campaigns the Calais refugee crisis has seen to date, attracting 25,000 Facebook likes since the beginning of August alone. Visiting Calais on a weekly basis, O’Hara and her friends meet with those that call the Jungle their (temporary) home, and document the stories of real people at the heart of the issue through colourful Instagram photos and moving stories shared on Facebook. O’Hara aimed to raise £1,000 to provide food, clothing and shelter to those she met, but her crowdfunding efforts have since raised more than £57,000. This article was originally published by Positive News.